Photo cameras are still popular although high-tech video cameras are already available at affordable prices. Strange phenomenon if we consider the logic. But when viewed from the side of art, this phenomenon is still acceptable. Art of photography can not be replaced by video, although video is very similar to the original event as it has moving images and sound. I have learned photography as my hobby since I was in high school. Some of my photos are published in this blog with label "intermezzo". How do we choose the right camera? First of all consider your needs. Do you need moving images and sound or video image, or simply capture the moment with a photo camera. I prefer to use a video camera, especially when capturing events or moments that take place continuously, such as weddings, birthdays, sporting events, and others. Those moments take place quickly and continuously, and we can not capture one by one. So by using a video camera, we can record every moment continuously. And then replay to see which moments are the best. By seeking out the best moments of recorded event, then we can get best frames to become photos. Some digital photo camera can also record video with excellent quality and length up to several hours. Currently various types of digital cameras available on the market at very affordable prices. Even the digital camera is bundled with other devices such as mobile phones and tablet computers. There are three types of photo camera, that are: pocket, prosumer and DSLR (Digital Single Lens Reflex). If you intend to carry the camera with ease wherever you go, then pocket type camera is suitable for you. Pocket-sized camera is small and easily stored in the pocket. It is lightweight and does not feel heavy in your pocket. The price also will not make you feel heavy to your pocket. That is why so-called pocket camera. If you want to create a sophisticated picture with high technique, DSLR camera is suitable for you. You can replace the camera lens with different type of lenses to suit every moment to be captured. The resulting image has a high resolution level reached 36.3 megapixels, so it can be enlarged to poster size, even can be printed for wallpaper size. DSLR camera can have different features and settings that can be tailored to your needs, such as setting: shutter speed, aperture diaphragm , ISO, and others. Various accessories for digital SLR cameras available for every shooting needs, to enable to produce the best image. The term Single Lens Reflex is to explain that the viewfinder is looking through the same lens with the lens used to take picture or so-called Single Lens. This allows the image is produced with the exact same scene viewed when aiming the camera. Viewfinder of SLR camera use a mirror to reflect light from lens to view through that lens. The mirror will quickly folded up when the photo is taken, this to allow the light from the object comes into the lens and to the film, the mirror movement is like a reflex movement. This is why it is popularly called Single Lens Reflex. And because the film is changed with digital system, then added the word and become Digital Single Lens Reflect or DSLR. Lens of SLR camera can be replaced easily with many different types, and the viewfinder is always seeing through the same lens with shooting lens. Now the digital SLR no longer use a reflector mirror that can move quickly. There is only a viewfinder screen and large additional screen that receives the image through the shooting lens. Just an opinion: maybe the name can be changed to ‘Digital Interchangeable Lens camera’. The figure below are DSLR cameras available at Amazon. The prosumer camera is the type of camera which has ability between pocket camera and DSLR. The price is affordable and comes with a fairly sophisticated zoom lens and features that exceed the pocket camera. Below are digital cameras from Amazon with affordable price. There is a type of camera called the Compact System Camera (CSC). This type combines a pocket camera with a DSLR, may be included in the prosumer class. CSC camera lens can be replaced like a DSLR camera. Another name for CSC camera is mirrorless camera, because this camera has no longer used a mirror to see from the viewfinder like DSLR. Because it combines compact camera and DSLR, the CSC camera is also called hybrid camera. CSC camera can record images with almost equal quality with a DSLR camera. Some photographers say that CSC can replace DSLR camera in the future. But currently CSC lenses availability are not as many as for DSLR. And because of different lens mounting, DSLR lenses can not be used for CSC. Photo camera does have more facilities than the video to produce better still image. The main facility is the flash, which obviously can not be rivaled by the video. With flash we can make good photographs with less light or even dark. Some camera have the red-eye reduction capability by turning on the flash before the photo is taken, and then turn on the flash again when the photo is taken. Light from flash is reflected by open wide eyes pupil causing eyes appear red when photographed. Light entering eyes through wide open pupils, light is reflected and passed through blood vessels makes eyes look red. By turning on the flash before the photo was taken to make eyes to adapt with the flash light and smaller pupils to minimize flash light reflection. If you need to take pictures in low light without flash, then you need to test the camera before you purchase it by pointing to a dark place, for example in a dark corner of the camera store. There are cameras that can be tuned its ability to capture light, called ISO. The higher the ISO the more sensitive to the light. But the higher the ISO value, the lower the sharpness of the image due to the reduced number of pixels. Some video cameras can be used to record with only starlight, but the picture quality is not very good. Usually the video image is green, when used with low light recording. You can make photo in the dark without flash with this video camera. There are trail cameras available today that can be used to shoot automatically if there are objects, humans, or animals are passing in front of the camera. Trail camera usually is used to monitor security, photographing wild animals, and others. Trail camera is equipped with the ability to record at night. Also equipped with an infrared lamp as a light for night vision, the light is invisible to the human eye but visible to the camera. Trail cameras have very affordable prices, please check to Amazon stock below. Zoom lens is an adjustable focal length lens, in other words can be used as a telephoto lens to zoom in or to make objects look closer, and can also be used with normal focal length to view like real distance to objects. If set at telephoto position, the zoom lens will make distant objects closer, and narrow angle of view. If set to a normal focal length, the zoom lens will capture the scene or object like our eyes see the scene or objects, that is the normal angle of view. Some of the zoom lens can be set for a wide viewing angle (wide angle) and can be used to photograph the vast landscapes, but the resulting picture is somewhat curved, for example: the horizon line does not look straight but curved. If a still camera equipped with zoom lenses that can be operated manually, not electronically with button, then we can make a photo with zooming effect. The resulting image looks like brush strokes from the center to the outside, it looks as if the object explodes when photographed. There are two types of zoom capability: optical zoom and digital zoom, total zoom is a combination of both. Usually the seller describes only the total zoom. Actually we do not really need digital zoom, it is performed by an electronic or digital, and it can be done with the computer when we do digital editing. Weakness of digital zoom that it will lower the image quality when the zoom is too big. So we better rely to the optical zoom, the zoom that can be done by the lens, optical zoom doesnt lower image quality. It should be noted that the camera with high zoom ability is sensitive to camera shaking. The recorded image will appear bluring when using high zoom and camera was shaking. These are effects that occur in telephoto lenses, where the point of view so narrow, and the distant objects looks closer. Little movement on the camera, eg a few millimeters, will create an object in distant move a lot, like moving a few meters as magnified by tele lens. So to prevent this you need to practice how to hold the camera zoom lens. The use of support such as tripod and monopod would be helpful. Tripod and monopod used by cameramen who are covering sports such as football matches. They have to capture moments from a distance of tens of meters and had to be enlarged with a telephoto lens or zoom, so monopod or tripod will prevent image shaking. Some cameras with powerful zoom lens, have digital feature to reduce the effect of camera shaking. Some cameras are designed with a pistol grip model as the photo below, such as Sanyo, Panasonic, Polaroid, Aiptek, DXG, Spectra, SVP, and others. Cameras of this type are proofen to have less shaking as better grip by the hand. Suitable for use for outdoor activities such as sporting events, camping, and others. Some cameras are not designed with a pistol grip, but can be attached with a pistol grip handle that can be purchased separately. The screen on the camera helps to manage the composition while shooting. Some cameras are equipped with a viewfinder in addition to having the screen, because the screen use much battery power. So if you need to save battery power, then use the viewfinder. I prefer the screen with flip type as it can be positioned to help us to look at the screen. There is a flip screen that can be directed to the front of the camera, so you can photograph yourself and adjust the composition by looking at the screen from the front of the camera. 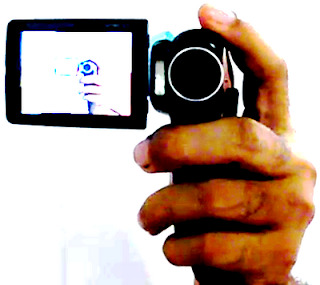 Photo above shows the type of camera with flip screen is rotated to front, photographed facing the mirror, note the same hand and the same camera on the screen. The screen also helps to see the results of shooting so we can retake the photo if the results are no good. With screen you can review and delete wrong photos in order to save memory. Some cameras have a photo editing features, you can edit photo with the help of this screen. Sharpness or resolution of the image depends on dots or pixels that were recorded by camera software. The more pixels the better, but it will creat big image file and needs large memory. For a postcard-sized photographs measuring 3.5 x 5 inches or 89 x 127 mm, and it is called the 3R size, 3 megapixel camera is good enough. Today they are pocket cameras with more than 10 megapixels sharpness. If you intend to make a detailed documentation for a natural scenery that can be enlarged, for example: you have to take picture of a hill with a variety of fruit trees. Later that photo will be used as documentation, and viewers can magnify images of that photo to see detail of trees on the hill and then enlarged again to see detail fruits on those trees. Then you need a camera with a very high resolution. Likewise, if you have to make landscape photos, model girl photos, etc., which will be printed very large, for example: to be affixed to a wall as wallpaper. Some cameras can use common dry batteries that are available on the market, this type can also use rechargeable batteries that are available on the market. Some other camera use a special battery that can be recharged, these type of cameras can only use batteries designed for them. Choose the safest camera for you for long term use, do not rely on a cheap one but then you can not buy new battery. Choose a digital camera that uses a storage container such as memory cards which are common in the market where you are. So you do not have trouble to add storage capacity. Choose a camera that uses a popular system to make it easy to share and print photos. You also need to ensure that the camera system does not conflict with your computer system. So you can store, display, edit, and print photos by your computer and your printer. Make sure the cable connections, such as USB, can be connected to your computer. Today there is waterproof camera that can be brought to dive to depths of 12 meters or more. This waterproof camera is available with pocket type at a price slightly more expensive than ordinary pocket camera. This camera is also designed for shock resistant (shockproof). Suitable for covering activities in the wild. And lastly, of course you have to choose a digital camera that suits your financial capabilities. Do not buy a sophisticated and expensive one as it’s technology could be obsolete within a few months, unless you really need the technology. You better buy the popular and not too expensive one. Because if many people are using it, it will be easy to share pictures, discuss with other camera users, easy to get accessories, and easily be repaired if damaged. If you want to resell it, the demand is hight so the price is not down too much. Popular products are usually have an easy and good warranty service.